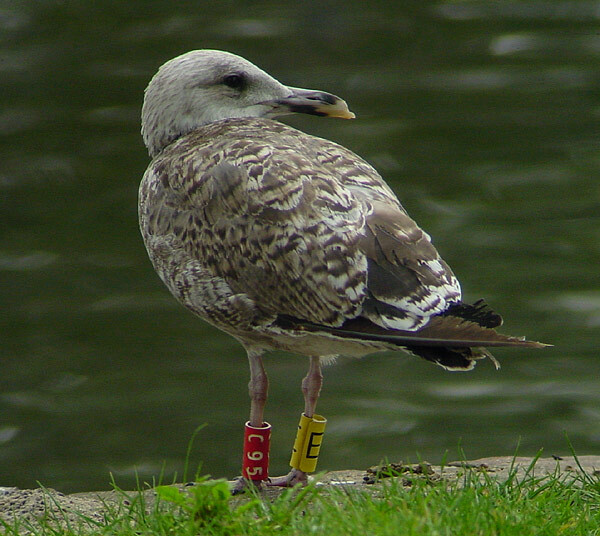 (7 images) LBBG 1cyC95EAugust 2003 - October 2004, Amsterdam, the Netherlands. Ruud Altenburg & Mars Muusse. 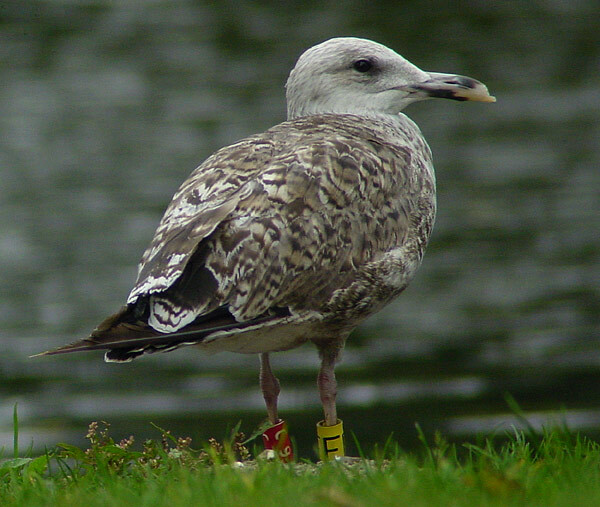 Some LBBG remain for most of the summer in The Netherlands, as this individual illustrates. 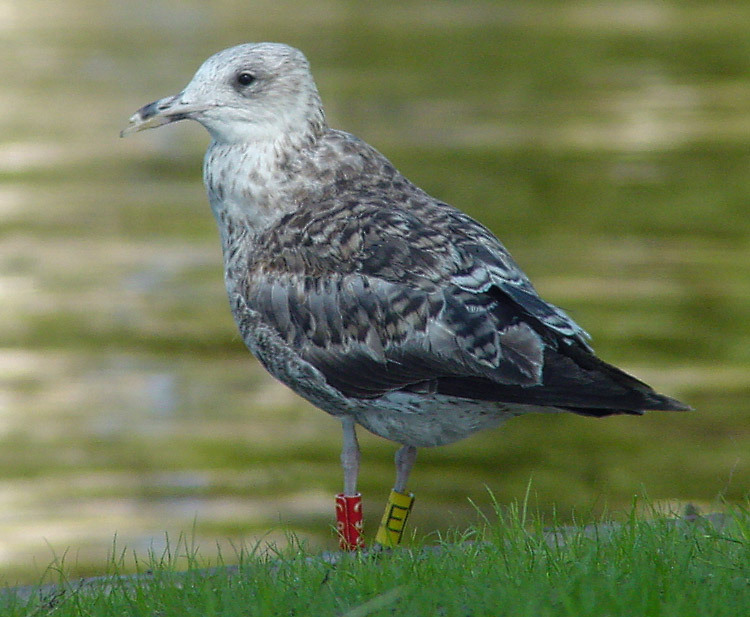 The gentle appearance suggest a female. 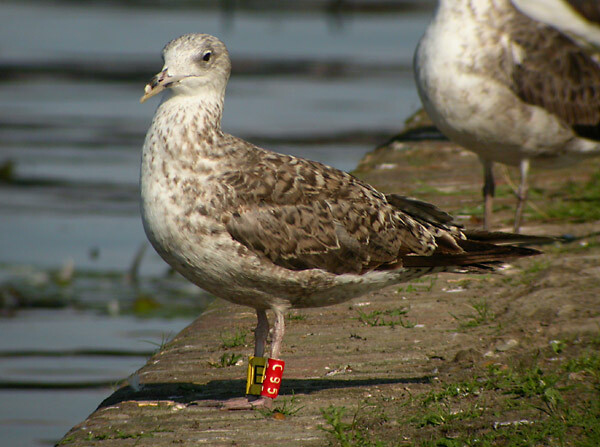 Note the second generation wing-coverts and upper tertials already by August in 1cy. In 2cy plumage, moult is delayed compared to average 2cy graellsii, with P10 still present by October. 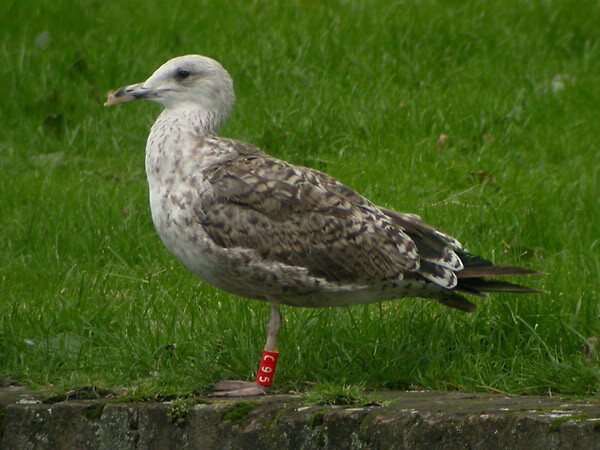 By November C95 disappeared with the outer-wings damaged. below 2 images: C95E August 31 2003, Amsterdam, the Netherlands. Pictures Ruud Altenburg. 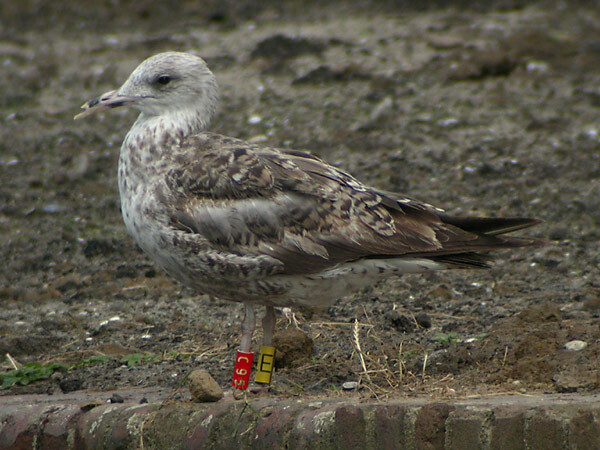 Juvenile Lesser Black-backed Gull red C95, ringed as pullus at the Maasvlakte on 26-06-03. A few scapulars, coverts and tertials have been replaced with second generation feathers. The upper mandible is slightly overgrown. image below: C95E September 27 2003, Amsterdam, the Netherlands. Post-juvenile moult is in full swing, as can be noted from the many new and missing scapulars. image below: C95E June 26 2004, Amsterdam, the Netherlands. Next spring, C95 has returned to the Erasmusgracht. The overgrown upper mandible has broken off, but the lower mandible also has grown out of proportions. The bird is in complete moult and currently replacing scapulars and most of its wing coverts. 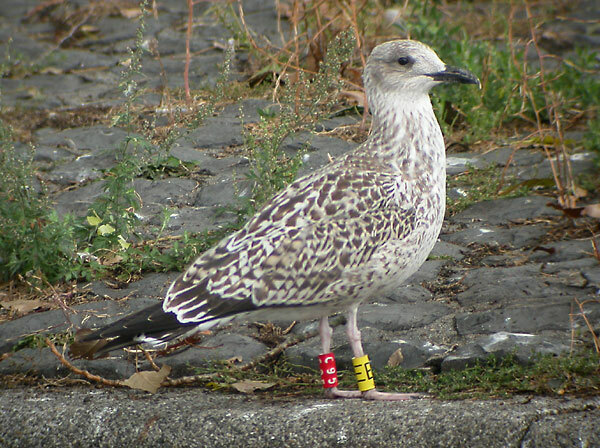 All visible primaries (P5-10) are juvenile. 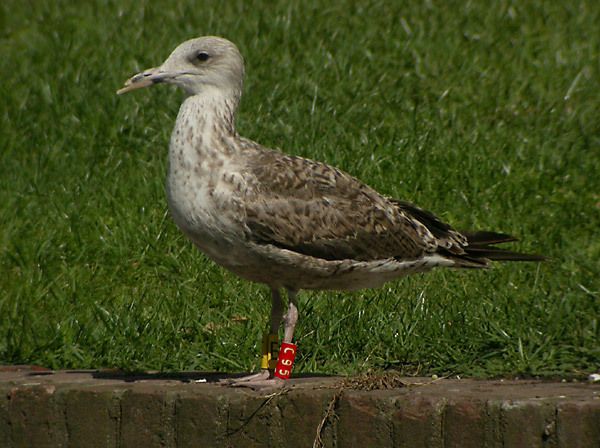 2 images below: C95E July 04 2004, Amsterdam, the Netherlands. image below: C95E July 06 2004, Amsterdam, the Netherlands. image below: C95E July 27 2004, Amsterdam, the Netherlands. Most scapulars have been renewed and new coverts and tertials are growing. The inner primaries have been dropped: only P7-10 are still juvenile. image below: C95E August 14 2004, Amsterdam, the Netherlands. The fresh mantle shows no trace of grey feathers; instead, the feathers are second generation-like. 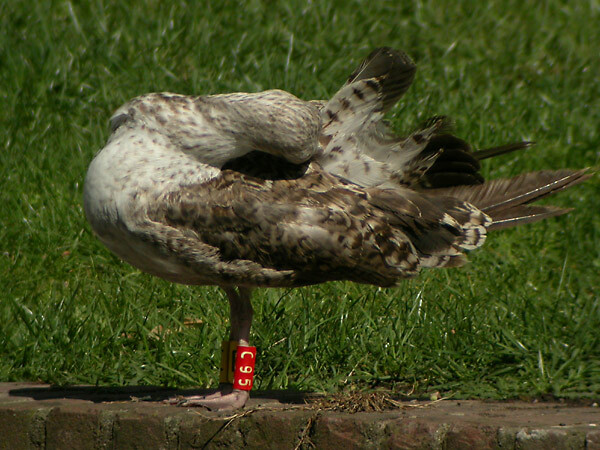 C95 has only recently started moulting its tail; the central feathers are missing (7). 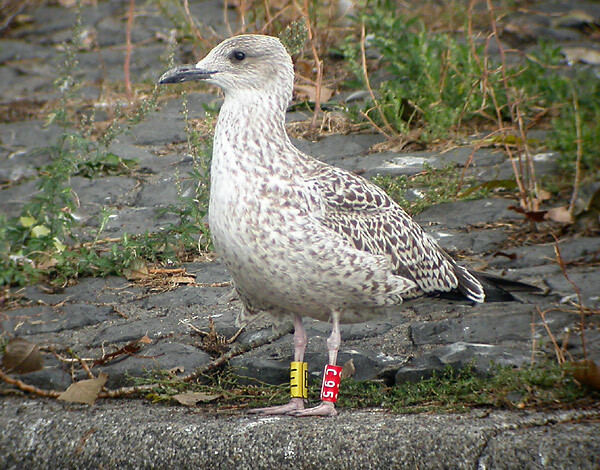 P8-10 still are juvenile and it is abnormal that there is no sign yet of a new P5 beyond the tertials. Judging from the way P8 is positioned, it may be displaced. The lower mandible too has broken or worn off and it appears C95 more or less has a normal bill again! 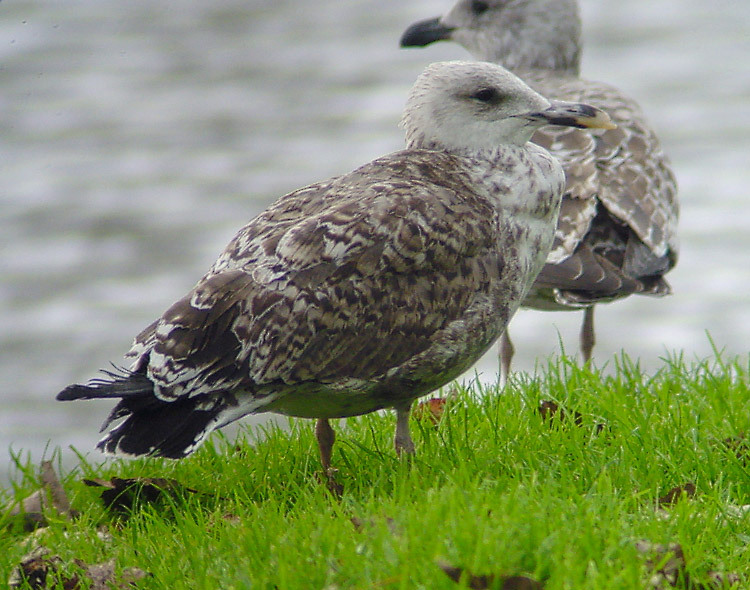 Primary moult is slow compared to other 2cy LBBGs: a fresh second generation P6 is visible, P9-10 are still juvenile. 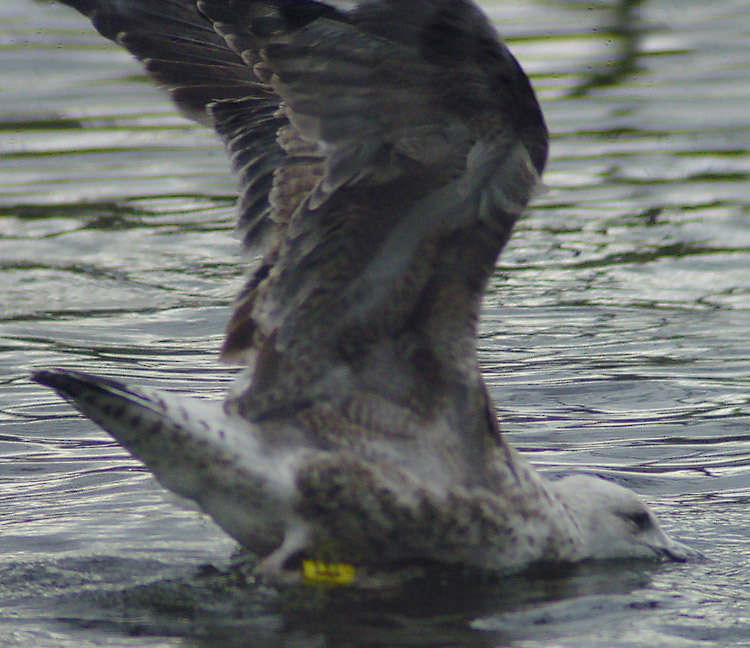 More central tail feathers have been dropped, only the outermost still are present. below 2 images: C95E October 01 2004, Amsterdam, the Netherlands. 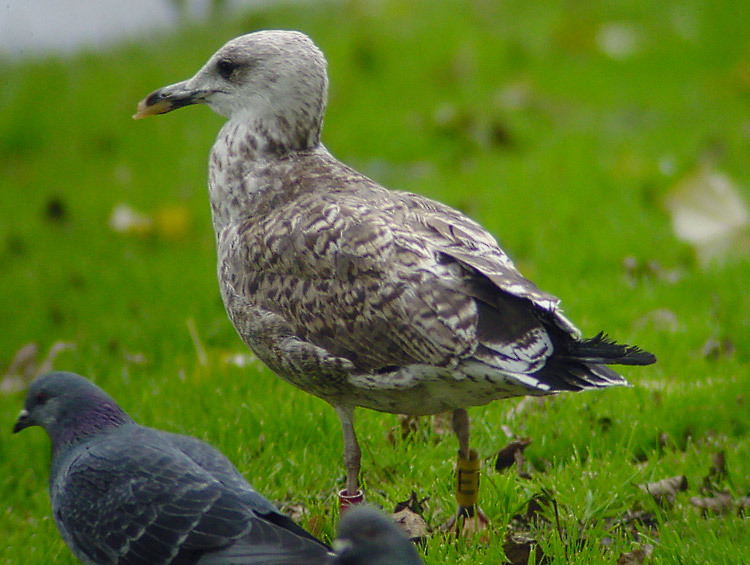 Late moulting individual with P10 still present by early October. 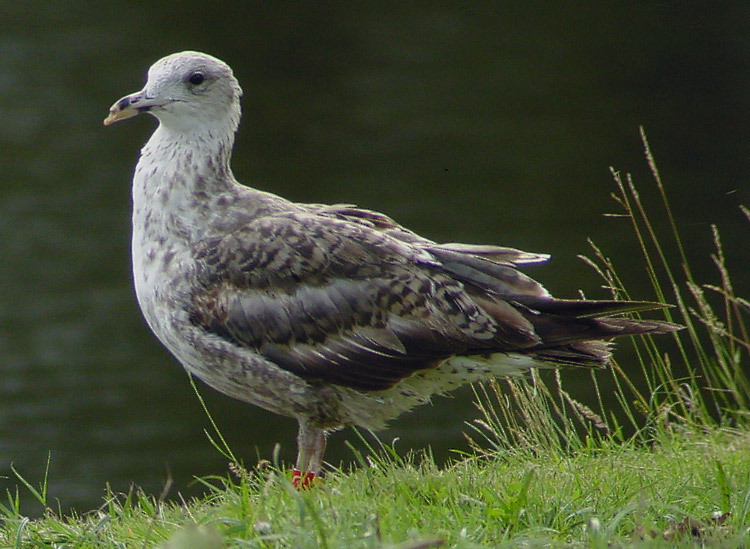 An example of a very barred patterned bird: most recently moulted feathers again have barring, lacking obvious grey feathers. below 3 images: C95E November 05 2004, Amsterdam, the Netherlands. 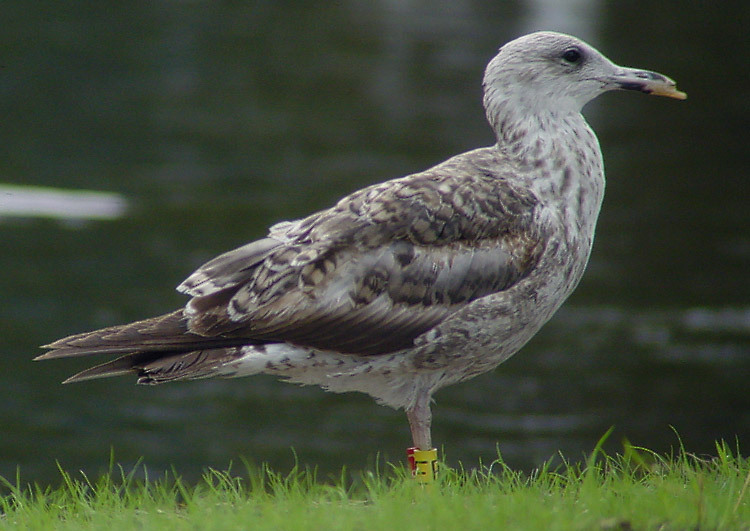 For unknown reasons moult progress in the outer wings has stopped or continues at very low pace, resulting in abraded outer primaries up to P7. Finally, P10 has been shed. 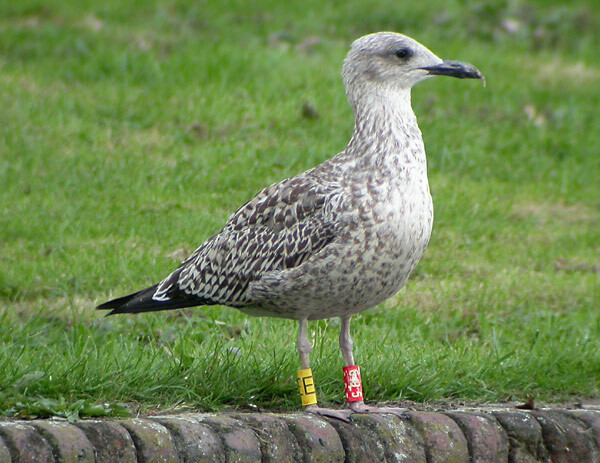 Its hampered flying capabilities have been met by running speed and on the ground maneuverability, when feeding on bread. This was the last date C95 has been seen and its likely it didn't survive this winter in Amsterdam.